Machinic Doodles is a live, interactive drawing installation that facilitates collaboration between a human and a robot named NORAA, a machine that is learning how to draw. It explores how we communicate ideas through the strokes of a drawing, and how might a machine also be taught to draw through learning, instead of via pre-programmed, explicit instruction. The installation is essentially a game of human-robot Pictionary: you draw, the machine takes a guess, and then draws something back in response. The project demonstrates how a drawing game based on a recurrent neural network, combined with real-time human drawing interaction, can be used to generate a sequence of human-machine doodle drawings. As the number of classification models is greater than the generational models (i.e. ability to classify is higher than drawing ability), the work inherently explores this gap in the machine’s knowledge, as well as the creative possibilities afforded by the misinterpretations of the machine. Drawings are not just for guessing, but analysed for spatial and temporal characteristics to inform drawing generation. An interesting aspect of the work is that NORAA is visually ‘blind’ in the sense that there is no camera, no image analysis – the drawings are encoded by the machine through a movement and sequence based approach (recording the motor rotations over time, along with timestamps for the pen up/down switch). The motor angle recordings are then translated to stroke data through the kinematics of the mechanism, before being sent to the drawing classifier. In the case of no direct match between classification and generation, an alternative generative model is chosen and drawn by the machine. NORAA was exhibited as a live, interactive drawing game installation: 'Machinic Doodles' at the V&A Museum’s Digital Design Weekend 22-23rd September 2018. The installation allowed members of the public to draw with NORAA, and to contribute drawings to the exhibition. Project team: Jessica In, George Profenza + Sam Price @mr_ribena. Thank you: James McVay, Krina Christopoulou, Naomi Lea, Ed Taft, Jess Chidester. Thank you also to IALab @interactivearchitecturelab, Ruairi Glynn @ruairiglynn, Sean Malikides @oldfortune_, Alice Whewell for their advice and support. 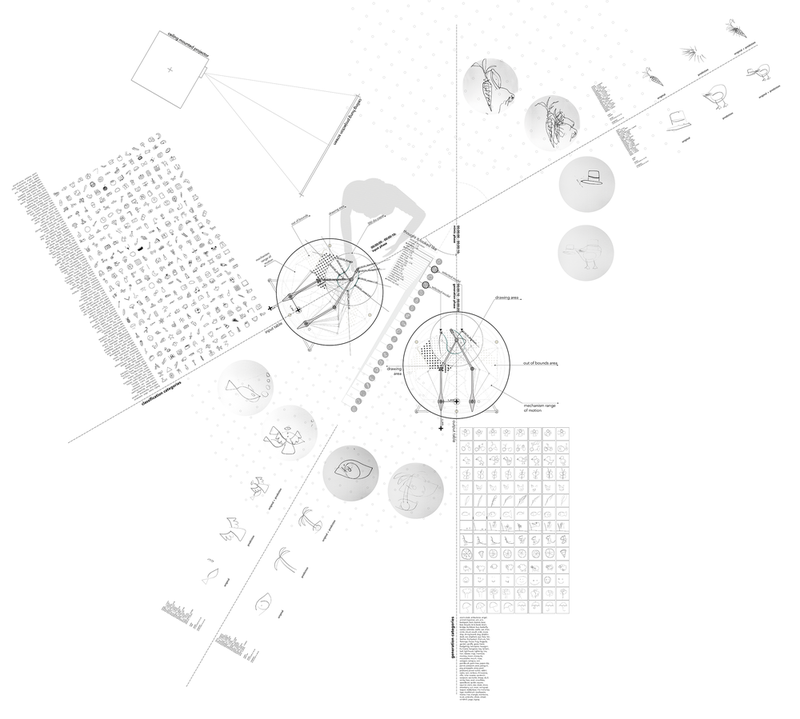 Irini Papadimitriou, Atau Tanaka, Theo Papatheodorou from Goldsmiths + V&A. 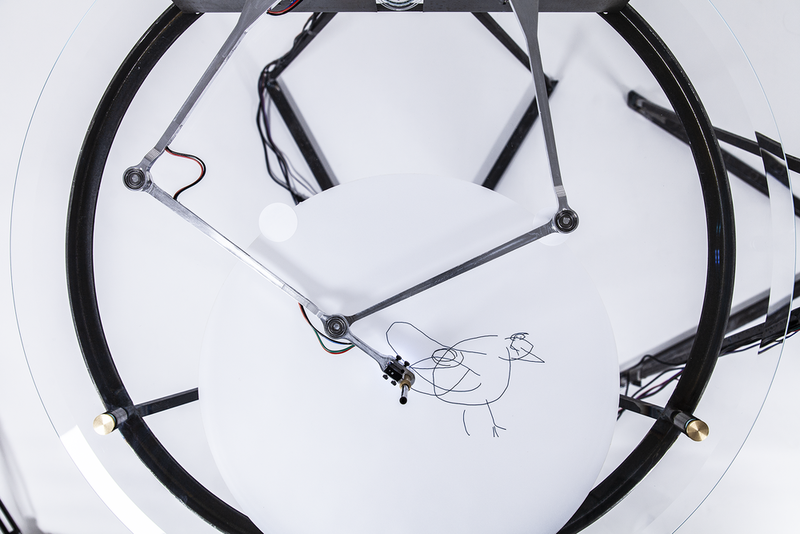 Machinic Doodles is a live, interactive drawing installation that facilitates collaboration between a human and a robot named NORAA - a machine that is learning how to draw. It explores how we communicate ideas through the strokes of a drawing, and how might a machine also be taught to draw through learning, instead of via explicit instruction.